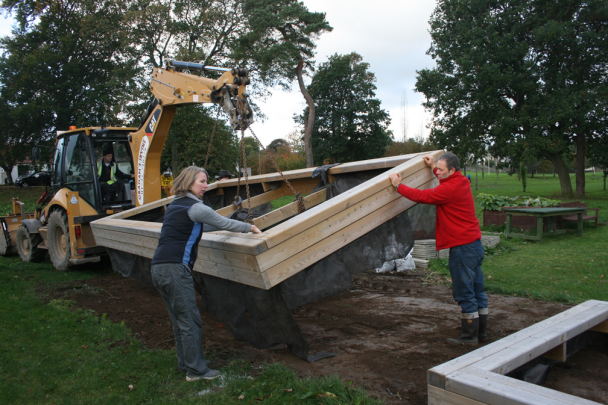 Our new raised beds (as reported in the previous post) were put in place last weekend by Mark from local firm Graham Irvine. Mark is a grand master of the JCB (actually it was a Caterpillar) – he levelled and lifted and spun and nudged and filled to our hearts delight. There is no doubt that these wonderful wooden beds have given the garden a shape and a structure. Autumn tasks ahead of us include putting in some winter colour in the beds, planning our crops for next year, and constructing some compost bins, sheds and accessible paths. Volunteers are beginning to come forward with offers of help, skills and knowledge but we’d love more people to be part of the garden as it begins to grow. Please get in touch with us if you would like to join in.